Moebius syndrome is a rare syndrome with congenital nonprogressive bilateral facial and abducens nerve palsy. It may be associated with other craniofacial dysmorphisms and congenital abnormalities of the extremities. The first description of congenital facial diplegia was given by Von Graefe in 1880  and this was soon followed by other reports. Incidence of Moebius syndrome is 1:50,000 to 100,000. Lower brain stem hypoplasia, hypoplastic cerebellum, focal necrosis, and calcifications of cranial nerve nuclei and straightening of the fourth ventricle floor have been reported in neuroimaging of Moebius syndromes. Agenesis of corpus callosum is an uncommon cerebral malformation reported in 1 in 19,000 unselected autopsies and 2.3% of mentally challenged children. Here, we report a rare case of Moebius syndrome with its rare associations in a 15-month-child with Dandy-Walker variant and complete agenesis of corpus callosum which to our best knowledge has not been reported previously. 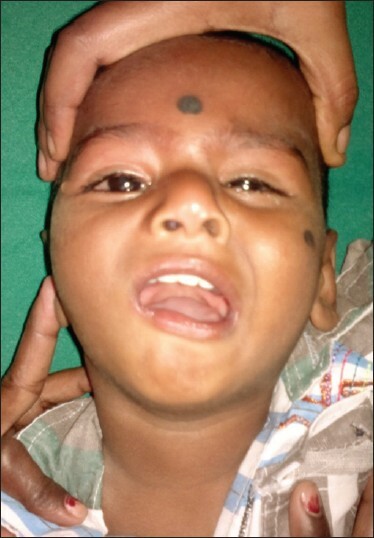 A 15-month-old male child 4 th born to second degree consanguineous parents by spontaneous vaginal delivery, presented with inability to close his right eye, drooling of saliva, difficulty in sucking, and deviation of the face to the left since birth. This was in the background of global developmental delay and at present he can sit with support, does not progress beyond cooing with normal vision and hearing deficit [Figure 1]. On examination, he has Grade III protein energy malnutrition (PEM) with his weight falling below 3 rd percentile according to World Health Organization growth chart, length was between the 3 rd and 25 th percentile and his head circumference was appropriate for his length according to Dines formula. On examination he is conscious, playful, oriented to person. Cranial nerve examination reveals bilateral abducen nerve palsy and right-sided facial nerve palsy, as he was unable to blink his right eye with loss of angle of mouth on the right side and deviation of the mouth to the left. He has bilateral hearing loss which was confirmed with brainstem evoked response audiometry. The metabolic screening test, serum lactate, and ammonium were within normal limit. With the clinical features the diagnosis of Moebius syndrome was entertained and neuroimaging was ordered as to rule out other abnormalities. The magnetic resonance imaging MRI of the brain showed complete agenesis of the corpus callosum with inferior vermian hypoplasia with prominent fourth ventricle which is consistent with the Dandy-Walker variant [Figure 2]. Moebius syndrome was first defined by Paul Julius Mobius, a German neurologist, in 1888, who reported patients with congenital, nonprogressive, bilateral VII and VI nerve palsy. In 1939, Henderson broadened the definition and included cases with congenital, unilateral, facial palsy. Primary criteria for diagnosing Moebius syndrome are facial palsy with impairment of ocular abduction. Dysfunction of other cranial nerves and orofacial abnormalities is commonly associated but not necessary for the diagnosis. The most common cranial nerves to be affected are V, VI, VII, and XII though any cranial nerves from III to XII can be affected. The child reported here has right-side facial nerve palsy, bilateral abducen nerve palsy, and bilateral 8 th nerve palsy with no other obvious cranial nerve involvement. The estimated incidence of Moebius syndrome is 2-20 per million live births. Only approximately, 300 cases have been described in the medical literature. The pathogenesis and etiology of Moebius syndrome appears to be multifactorial and remains controversial. No diagnostic laboratory studies yield findings specific of Moebius syndrome. Computed tomography CT and MRI include hypoplasia of the pons or medulla, depression of the 4 th ventricle, absence of the medial colliculus at the level of the pons, absence of the hypoglossal prominence, calcification in the pons in the region of the abducens nuclei, and cerebellar hypoplasia. The corpus callosum is phylogenetically a recent structure and its absence is not lethal. The corpus callosum develops between the 8 th and 22 nd weeks of gestation and disturbed embryogenesis during this period can lead to corpus callosum hypogenesis or agenesis. The etiology of this anomaly is often unknown, isolated agenesis of corpus callosum may be either a completely asymptomatic event or revealed during the course of a neurological examination by subtle deficits. The most common associated brain anomalies were interhemispheric cyst with hydrocephalus and Dandy-Walker malformation. Dandy-Walker variant includes vermian hypoplasia and cystic dilation of the 4 th ventricle without enlargement of the posterior fossa. The child we report also has clinical features suggestive of Moebius syndrome with MRI findings consistent with complete agenesis of corpus callosum with Dandy-Walker variant. After a thorough literature search no case of Moebius syndrome with unilateral facial nerve/bilateral abducen nerve palsy with Dandy-Walker variant and complete agenesis of corpus callosum was reported though association of agenesis of corpus callosum with Moebius syndrome was reported in an 18 month old child. Gene for Moebius syndrome has been localized to long arm of chromosome 3,  the more precise location of 3q21-q22. Dandy-Walker syndrome has also been associated with the defect of chromosome 3q24-q26. , Genetic studies could not be done due the lack of facilities. Further genetic studies are needed to prove any syndromic association. 1. Von Graefe A. In: Von Graefe A, Saemisch T, eds. Handbuch der Gesamten Augenheilkunde. (Handbook of Ophthalmology) Vol 6. Leipzig: W Engelmann 1880:60-67. 2. Pastuszak AL, Schüler L, Speck-Martins CE, Coelho KE, Cordello SM, Vargas F, et al. Use of misoprostol during pregnancy and Möbius′ syndrome in infants. N Engl J Med 1998;338:1881-5. 3. Gorgono JL. Children with agenesis of corpus callosum, Dev Med Child Neurol 1968;10:613-6. 4. Verzijl HT, Padberg GW, Zwarts MJ. The spectrum of Mobius syndrome: An electrophysiological study. Brain 2005;128(Pt 7):1728-36. 5. Kuklík M. Poland-Möbius syndrome and disruption spectrum affecting the face and extremities: A review paper and presentation of five cases. Acta Chir Plast 2000;42:95-103. 6. Byrd SE, Radkowski MS, Flannery A, McLone DG. The clinical and radiological evalution of absence of corpus callosum. Eur J Radiol 1990;10:65-73. 7. Alam A, Chander BN, Bhatia M. Dandy walker variant: Prenatal diagnosis by ultrasonography. Med J Armed Forces India 2004;60:287-9. 8. Ashrafi , Hussain I, Zamani SM. 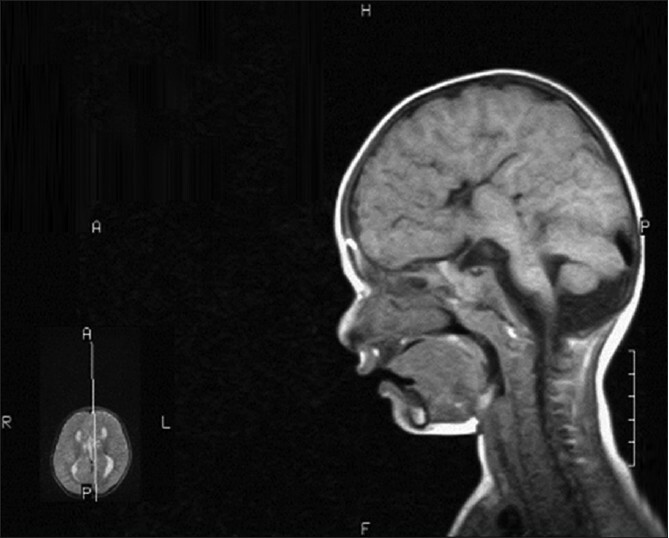 Möebius syndrome and corpus callosum agenesis; a case report. Acta Medica Iranica 2006;44:432-4. 10. Ferraris A, Bernardini L, Sabolic Avramovska V, Zanni G, Loddo S, Sukarova-Angelovska E, et al. Italian CBCD Study Group. Dandy-Walker malformation and Wisconsin syndrome: Novel cases add further insight into the genotype-phenotype correlations of 3q23q25 deletions. Orphanet J Rare Dis 2013;8:75.